There are a great many faults in the UK tax system, but in this paper three authors look at just a few from different angles. 1. VALUE ADDED TAX, THE STEALTHIEST OF STEALTH TAXES. By Duncan Pickard. The author is a working farmer, who has had a good deal to do with VAT in practice. In 1954 France was the first country in Europe to introduce a national VAT. France persuaded Germany and then other “common market” countries to adopt VAT. When any country wanted to join the EEC, which became the EU, it had to have VAT. It was introduced in the UK in 1973. VAT is the most harmful to economic activity of all the harmful taxes. It is the largest of the indirect taxes and affects poor people much more than the rich. The poorest fifth pay 31% of their take- home pay in indirect taxes, the richest fifth pay 13%. VAT is a popular source of income for fraudsters. By inhibiting trade in goods and services through increasing their final price to consumers, VAT inhibits employment and the production of wealth. It also destroys its tax base. This has been more evident since 2008, especially in countries such as Greece, where VAT revenue has fallen markedly. The USA has no Federal Sales Tax, the US Constitution does not allow it. Individual states have sales tax (VAT) but the rates are low, competition between states keeps them low because customers for goods and services would trade in the states with the lowest tax rates. Because individual states cannot increase tax revenue by increasing sales tax, they rely more on taxes on property which are less harmful to the economy. This is the reason why the US economy has suffered less badly than that of the EU since 2008. The best way to obtain revenue for the funding of government is to collect annually the economic rental value of land (LVT) because it has no detrimental economic effects and promotes the production of wealth. VAT is the favourite tax of politicians. They approach the taxing of people`s earnings like plucking feathers from a live goose; that is, to remove as many feathers as possible with the minimum of squawking from the goose. Their economic advisers do not dissuade them because these economists do not bother to record or study the relative harm done to the national economy by the various taxes. VAT is preferred because people protest less compared with their response to an increase in other taxes, even though they are not so harmful to them, being unaware of that fact through being kept in ignorance. This article has been based on “Europe`s Fatal Affair With VAT”, by Mason Gaffney. 2. HOW TAX CREDITS INCREASE TAX RATES. By Ann Fennel. The author is an active member of “Mothers at Home Matter” and has particular experience of the problems of teachers. But a great many people in different jobs have encountered similar problems. Take a family with 2 children on the average wage about £26k. The father is a primary classroom teacher and his wife is at home looking after their two young children. The family decide they would like to buy a car and need an extra £3k year or £58 week to meet the purchase, running and maintenance costs of a car. The father is able to do this by taking on extra hours. However they calculate that although he can earn £3k more this will not make much difference to the family’s income. He would have to earn almost £220 per week more or £11,500 a year more to do so. This is because for every pound he earns the Treasury takes back 73p – income tax accounts for 21p, national insurance 11p and reduction in tax credits 41p. This in economic terms is referred to as the effective marginal tax rate, and it is 73%. What option does this family have? It is impossible for him to earn an extra £11.5k. What they can contemplate is his wife going out to work. And she can work hard and bring home extra income to the family. Her earnings will bring home more than his can. She will be taxed at a lower rate or not at all. However she is already employed taking care of the young children (although unpaid). She has to find someone to replace her and obviously the person who replaces what she does has to be paid a decent wage. The mother therefore needs to earn more than she pays out to a childminder or nursery to do the job she was doing for ‘love’ and ‘not money’ to make this affordable. The family feel trapped. Four million families, nearly half of all families are caught in this tax trap. Tax credits subsidise income and although the subsidy may be a generous one its effect is to take away the pressure on employers to pay decent wages, it destroys incentives for the main breadwinner to work harder and forces the mother (or second earner) into the workplace if the family need to bring home extra income. It also has the effect that when great policies are introduced such as the raising of the tax threshold to £10k, families on tax credits will see very little difference to what they have to spend because as their income increases so their tax credits decrease! Take a family with 3 children, living in London. The father is a Head of Department at a secondary school and is earning £50k salary. He has a family with 3 young children and his wife stays at home to care for them. He has been offered promotion as a Deputy Head at a different school a bit further away. His hours be longer, he will have extra responsibility, and have to travel further. But he will be rewarded with an increase to his wage of an extra £10k. In practice however he will find that he will bring home only £3,300 of that increase. He loses 65p for every pound earned in tax, NI and loss of child benefit. Should his wife return to work instead she can earn the full £10k without paying tax, and they can keep their child benefit. They will be significantly better off. This is why some mothers are returning to work. The removal of child benefit has been implemented in a most unfair way and in a way that demonstrates what is so wrong with our taxation system. The UK is almost alone amongst developed countries in not recognizing either the household income or the number of dependents on that income in the taxation system. It has led to the grossly unfair anomaly that single earner families on £60k will lose their child benefit while dual earning families can earn up to twice that much as a household before they lose it. Added to this the Coalition government has announced that families will receive a tax allowance to help with the cost of childcare, BUT ONLY WHERE TWO PARENTS WORK. These families will receive a tax allowance up to £2k per child per year up to an extraordinary household income of £300,000. But unfortunately Treasury coffers are limited and they could not possibly think of supporting the stay at home mother in her ‘lifestyle choice’! Focus groups have identified the impoverishment of single earner families. Joseph Rowntree Foundation have found that the number of children in poverty where one parent is working has grown massively since 2002. 52% of children living in poverty are in single earner families! JRF and Resolution Foundation have been campaigning for ‘work to be the way out of poverty’. Together with Childcare pressure groups the clamour has been for affordable childcare. All political parties have joined this bandwagon also citing the emancipation of women from the home and their fulfillment in the workplace. Indeed Lucy Powell at the Labour party conference said “We are almost seeing a bit of an arms race going on between the three main parties coming forward with policies on childcare.” But no political party is talking about the injustices that force the mother away from the family in the first place. Or the enslavement to a wage and timetables set by work. Or whether it meets the needs of very young children. In economic policy the underlying principle is that the Family should be the basic unit for economic consideration. In matters relating to the family the family or household income must be taken into account. All anomalies arise from not doing so. The chart shows how actual disposable income rises only slightly as higher gross incomes are earned, due to the cutting back of tax credits until they are extinguished at over £50,000 gross. 3. THE COMBINED EFFECTS OF TAXES ON WAGES. By Tommas Graves. The author is a Chartered Accountant whose work requires him to consider just what effect taxation has on everybody’s income. What this chart shows is the constituent parts of the cost of wages to an employer. For any given gross pay shown on the left, 100% is the employers’ cost including Employers National Insurance contributions in purple. Indirect taxes are shown in green, direct taxes, PAYE and Employees NIC in orange. The blue part is what is left to the employee to spend, excluding VAT and other indirect taxes, which we have called “reward for work”, ie take-home-pay less indirect taxes. The date from which this chart is drawn may be examined at. A particular aspect that is mostly forgotten is that Indirect Taxes impact more heavily on the poor. The Office for National Statistics publish an occasional table which shows that the lowest quintile of earners pay 31% of take-home-pay in indirect taxes, while the top quintile only pay 13%. 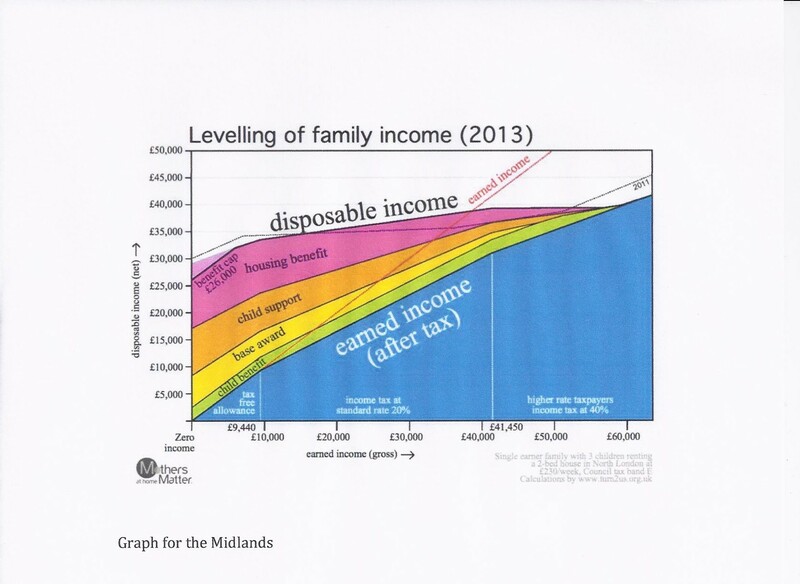 As the chart shows, this partly counteracts the lower Income Tax and NIC suffered by the lower paid group. The overall effect is to show that of the total cost to the employer, at least half is taken in tax. Or, perhaps, the cost of wages is double the actual reward for work enjoyed by the employees. If the Chancellor was to promote a policy of doubling the cost of wages by the imposition of taxes, he would presumably expect certain thing to happen as a result! 1. A sharp distinction of the view of wages from the points of view of employers and employees. 2. A bias against labour intensive industries. 3. A constant impulse to replace people by machines. 4. Unemployment as a constant factor in the economy. 5. The effect of taxation at the margin, leading to more tax required to mitigate those effects. 6. In the cycle of production, employment based taxation rolls up until paid by the final consumer. His gross pay has to be sufficient to pay the taxes and leave him enough to live on. 7. Government expenditure is mostly wages, and is thus doubled under the same rules. 8. In order to cover the cost, an employee has to be able to add value to an amount twice what he needs to live on. Those who cannot meet this criteria will find their jobs at risk. Is it any surprise to find that these things have actually happened?